Good morning folks! I’m in an awesome mood today. First off, it’s my birthday, I’m 33, and I’m loving every second of my life. 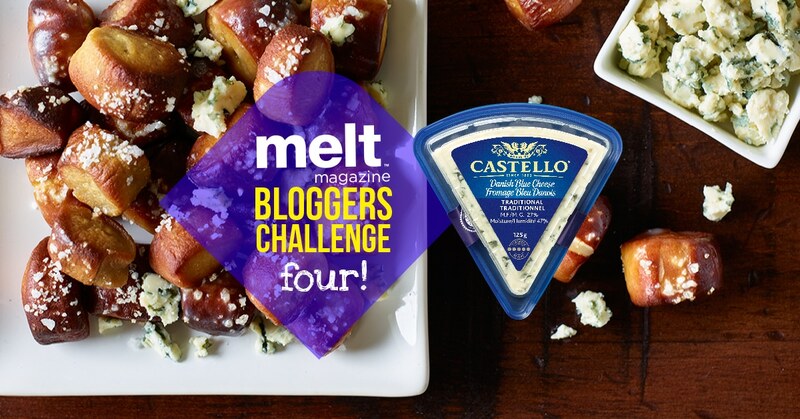 Secondly, I finally get to share this ridiculously good recipe for garlicky blue cheese tossed pretzel bites, that I created for Melt Magazine as part of their fourth Blogger Challenge. We were tasked to create a movie night at home snack that features blue cheese (I was a little worried at first, blue cheese can be a tough one to get people to try). Vote for me here! Now, when I’m at home watching a movie, which is basically every friday night, I want need a bowl of something that I can just keep tossing into my mouth. The obvious go-to was popcorn, but that was just too expected. Then it clicked. Something that the kids and I love are giant, soft, salty pretzels. Even better if they’re a bit buttery and garlicky. You know what goes awesomely with bread, butter, and garlic? Salty and tangy blue cheese. You know what makes a giant, soft, salty pretzel even better? Making it bite size. I had it, my toss in a bowl, pop in your mouth, ultimate movie night at home snack: blue cheese tossed pretzel bites. Note: if you’ve got little ones at home that just can’t do the blue cheese thing yet (like mine, outside of Anna), just set aside some bites for them before tossing with the cheese. I’m going to ask you all for a favour now. The recipe is being voted on right now, and the one with the most votes at the end of the month gets featured in the next issue of Melt Magazine – obviously something that I would LOVE! Please, if you like the recipe, or just think I’m the bee’s knees and want to do me a favour, click here to vote for me. Add the warm water and yeast to the bowl of your stand mixer. Let sit for 5 minutes; mixture will become foamy. Add the flour, kosher salt, brown sugar, and softened butter to the bowl and mix, with the dough hook, for 10 minutes. The dough should be soft and smooth, a little tacky, but not stick to your hands. If too sticky add a little bit more flour. Lightly oil a large bowl. Turn the dough out into the bowl, roll around to coat in oil, then cover tightly with plastic wrap. Let the dough sit for three hours on your counter, it will more than double in size. Preheat your oven to 450ºF (230ºC) and position a rack in the top and bottom. Generously oil two baking sheets or cover with parchment paper. Bring 8 cups of water to a boil, then add 1/2 cup baking soda. Punch the dough down, then divide it into 16 equal pieces (so into quarters, then each quarter into quarters). Roll each piece into an 8" long rope, then cut into 1" long pieces. Drop the pieces into the boiling water, in batches, and let cook for one minute. Remove using a slotted spoon to the prepared baking sheets, and immediately sprinkle the tops with salt so that it sticks. When all the pretzels are on the sheets, add the pans to the oven. Bake for 6 minutes, then rotate the pans from top to bottom, back to front, and bake for an additional 6 minutes. The pretzels should be a dark golden brown. Remove the bites to cooling racks to hold. Up to this point can be done up to 1 day ahead of time. Just before serving, melt the 2 tbsp of butter in a small skillet over medium heat. Add the garlic and simmer over low until the garlic is translucent, not browned, about 3 minutes. Toss half of the pretzel bites with the garlic butter mixture and crumbled blue cheese. Pour into a bowl, and top with additional Blue Cheese if you'd like. I can’t finish off this post without mentioning the four other great bloggers in the challenge. Lillian at Beyond Umami made some delicious looking Raspberry Balsamic Castello®Blue Cheese Hand Pies. Laureen at Art and the Kitchen made Steak and Castello® Blue Cheese Bites that sound right in my wheelhouse. Asima from Haute Sucre created some stunning Apple & Castello® Blue Cheese Fritters, and Carole over at The Yum Yum Factor made some Castello® Blue Seoul Nuggets, that I now realize were missing from my life. You can check out all of these awesome recipes here.